Right from the first inning it was obvious this was not going to be a typical game. Even by World Series Game Six standards, this one was out of this world. And that is where Mike Sergio came from, drifting down onto the Shea Stadium infield in a parachute with a modest “Go Mets” sign hanging off it. A veteran skydiver and a middling actor, he made the jump because he was incensed by a balloon-festooned banner at Fenway Park that he had seen on TV. He would serve jail time the following summer for his breach of airspace and flouting of an untold number of laws. But he was quickly hustled off the field in Game Six and the first pitch by Bob Ojeda was thrown less than a minute after he landed. The game was what mattered. And what a game. After being so rudely interrupted from above, the Red Sox scored in the first on a double by Dwight Evans and added another in the second on Marty Barrett’s RBI single. That seemed as though it could go a long way with Roger Clemens on full rest pitching full bore and no-hitting the Mets through four innings, but the Mets were making Clemens work. He threw 72 pitches (49 strikes) to get that far and the crowd was working him, too. Chants of “Ro-ger! Ro-ger” were payback for the derisive catcalls by the Fenway faithful of “Dar-ryl! Dar-ryl!” Darryl Strawberry started the home fifth with his second walk of the night and – just as he’d done in the second inning – he stole second. On the next pitch Ray Knight singled through the middle and Strawberry crossed the plate to cut Boston’s lead in half. Mookie Wilson singled to right field and Knight took third with no one out when Evans bobbled the ball. That proved key since Danny Heep, batting for Rafael Santana, bounced into a double play that tied the game. It marked the first time, other than 0-0, that a 1986 World Series game was tied. Given a reprieve, Bobby Ojeda batted for himself (he grounded out) and threw another inning. Going six innings was quite a feat for Ojeda since Boston had runners on base in all but one inning yet left eight on base against Ojeda. The Red Sox took advantage of shoddy defense by the Mets in the seventh against Roger McDowell, with Knight’s errant throw pulling Keith Hernandez off first to put runners on the corners. Boston, without a steal attempt in the Series, tried the hit-and-run several times and usually sent runners on 3-and-2, as the Red Sox did with Jim Rice in the seventh. His jump enabled him to beat a throw to second on what looked like a double-play ball. The Mets got Dwight Evans at first, but because Rice was safe at second, Marty Barrett crossed home plate for a 3-2 Boston lead. When Rich Gedman followed with a single it looked as if Boston would double its lead, but for the second time in the Series, Mookie Wilson, who had a notoriously weak arm and had undergone shoulder surgery the previous winter, threw to Gary Carter on the fly and the catcher rode Rice away from the plate for the third out. Rice’s speed, or lack thereof, had kept him from scoring on Evans’s rattling ball in the gap in the first inning, and it haunted Boston again, but not nearly as much as much as a decision by John McNamara that would stay with Red Sox fans for years to come. A blister on Roger Clemens’ pitching hand kept him from being effective with his breaking pitches and he logged 134 pitches through seven innings, but it was a time when the number of pitches was often ignored and Clemens had thrown 10 complete games during the season while logging 155⅔ more innings than the previous year (not even counting his five postseason starts covering an additional 34 innings). But with a runner on first and no one out in the eighth inning against McDowell, McNamara had Spike Owen bunt, and then he batted for Clemens with Mike Greenwell – highlight on “green” for the 23-year-old outfielder who had yet to even play enough to qualify as a rookie. He fanned on three pitches. With Clemens done, ex-Met Calvin Schiraldi came in in the Mets eighth to try to finish off the first Red Sox title in 68 years. He gave up a hit to the first batter he faced, Lee Mazzilli, batting for Jesse Orosco, who had thrown one pitch to finish the Red Sox eighth. Lenny Dykstra followed with a bunt and Schiraldi bounced the throw to second. The Mets wound up tying the game on Gary Carter’s sacrifice fly. The tension trebled. The bottom of the ninth seemed like a carbon copy of the eighth, with the Red Sox messing up the force play on a bunt. This time it was Rich Gedman who made a bad throw. The difference was that Davey Johnson, never a fan of the sacrifice, bunted twice in a row in the eighth and the Mets scored; in the ninth, pinch-hitter Howard Johnson looked bad trying to bunt the first pitch, swung away on the next, and fanned on the third pitch. The Mets did not score and the game moved to the 10th. The second-guessers took a front-row seat when Dave Henderson homered just above the “a” in the Newsday sign. Many scribes started moving toward the visiting clubhouse, where champagne – loaned to the Red Sox by the Mets – was now being iced. The championship indeed looked for all the world to be on ice when Boston scored a second run off Rick Aguilera on Marty Barrett’s single. With two outs in the bottom of the 10th, with the baseball world wondering how the Mets hadn’t bunted a second time in the ninth, with writers – depending on where they hailed from – either spouting lyrically about the end of an epic New England baseball drought or New York’s failure to get down a bunt, and with frustrated Keith Hernandez sitting in his manager’s office drinking a beer, the game changed. Gary Carter singled. Pinch-hitter Kevin Mitchell singled. Ray Knight, down 0-and-2, singled to center to score Carter and send Mitchell to third. John McNamara came out, took the ball, and handed it to Bob Stanley. 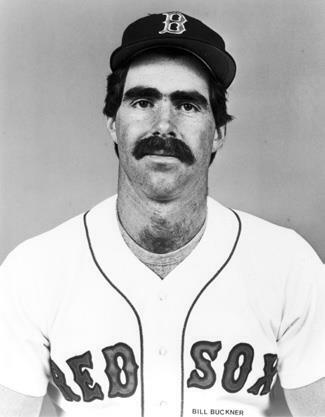 Stanley, who led Boston with 16 saves – Schiraldi, not called up from the minors until late July, was third on the club with nine – faced Mookie Wilson, whom he’d faced three times, retired twice, and struck out once in the Series. With the count 2-and-2, Wilson jackknifed out of the way of a slider that, in the words of the man who called it, Rich Gedman, “ran inside a little bit and I didn’t get it.”1 The ball went to the backstop, Kevin Mitchell scored, and the game was tied. With Shea Stadium shaking, the Mets dugout ecstatic, Keith Hernandez superstitiously refusing to leave the manager’s office during the rally, and Mookie Wilson still at the plate, the game hurtled toward its implausible climax. No words were spoken on NBC for three minutes as announcer and network let the reactions on camera and the screaming by the fans say it all. Sometimes words just can’t adequately capture a moment. When Marv Albert put microphones in front of Wilson and Knight, they didn’t have much luck, either. There wasn’t much left to say, or give. “I’m just exhausted right now,” Knight admitted. “I’m happy, but I’ve never been more tired than I am right now.”3 Boston was sick and tired, especially given that Dave Stapleton had replaced the ailing Buckner at first base for defense every time Boston held the lead in the final inning during the postseason. With one unforgettable exception. This article originally appeared in "The 1986 New York Mets: There Was More Than Game Six" (SABR, 2016), edited by Leslie Heaphy and Bill Nowlin. Read more game stories from the book at the SABR Games Project by clicking here. 1 Author interview with Rich Gedman, August 14, 2014. 2 New York Mets 1986 World Series Collector’s Edition, Game Six. MLB Official DVD, A&E Home Video, 2006.